I want to squeeze in a last recipe in April, as I have posted comparatively little this month. I mentioned in one of my earlier April posts that we had a streak of bad luck. It seems over but we are still picking up the pieces. Since I didn't really have time for culinary disasters (even though they are not as tragic or annoying as those other disasters of ours), I sought an easy way out and took my Almond Molasses Biscotti. 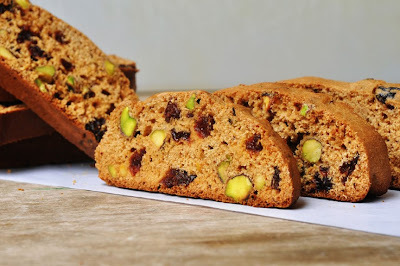 I simply changed the main flavor-giving ingredients by adding toasted pistachios and dried cherries to it. I tried this combo some time ago with a different recipe, but they turned out crumbly and hard to cut. In a bowl, combine flour, salt, baking powder and cinnamon. Mix until well blended. In a dry non-greased pan, toast the pistachio kernels over medium heat, for about 3-5 minutes. Stir occasionally. Let cool, then chop roughly. Stir in chopped pistachios and dried cherries to the flour mixture. In another bowl, whisk together the egg, vanilla extract and agave. Pour the egg mixture onto the flour almond mixture. Stir until all ingredients are incorporated. Spread some flour on a clean kitchen surface and knead the dough for a couple of minutes. Form a flat long log, about 1 inch high and 5 inches wide. Bake for about 20 to 25 minutes or until center feels firm to touch. Let the log cool for about 15 minutes or until cool enough to handle. Use a serrated knife and cut 1/2 inch slices off the log. Reduce heat of the oven to 120C. Spread out the biscotti slices on the baking sheet and bake for another 20 minutes. Turn them over halfway. Let cool completely.Store in airtight container.